Another great kit which divides opinions. Actually I should state that I can’t think of anything else, apart from maybe pizza toppings or Radiohead that divides opinion on the whole more than football kits. As seen on this site, one person’s masterpiece is another person’s stinker. 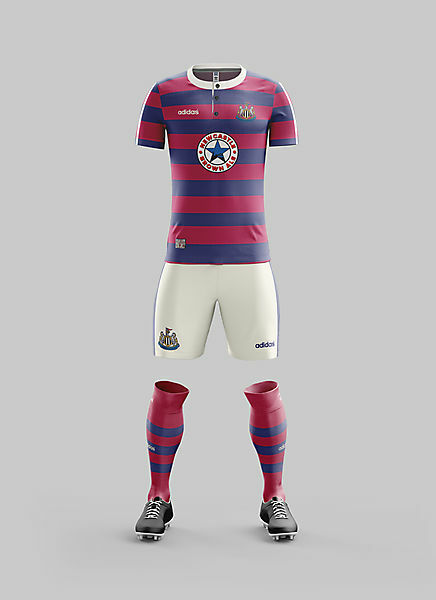 Unbelievably this Newcastle kit makes some ‘worst kits’ lists which is pretty disgraceful. A strange mix of fuschia red (depending on the light) and denim/navy/blue (depending on the light) hoops placed on a shirt with a rugged old granddad collar. The shorts are a kind of biscuit colour which match the collar, depending on which version you have. Fine details were revised on this kit. The buttons are either navy blue or a tannin colour. A one off kit ahead of its time, best showcased by housewife’s favourite (even then) David Ginola.